I suddenly had the urge to write something. As I sit here, with my iPad, syncing documents to iCloud; adding to the same documents on my iPhone later in the day, then editing and completing them on my desktop computer in the evening, ready to post to my website, created in the UK and hosted in New York, I have the overwhelming desire to write something. "But you are", I hear you say. I mean actually write, with a pen, on paper. Not a roller ball gel pen either, but a fountain pen. One which requires filling with ink, from a bottle. Last week, whilst buying stationery for my business, I spotted a small notebook. Bound in soft leather, containing pages of crisp, high quality paper and a cover page, printed with the words "This Journal Belongs To". I couldn't resist it. 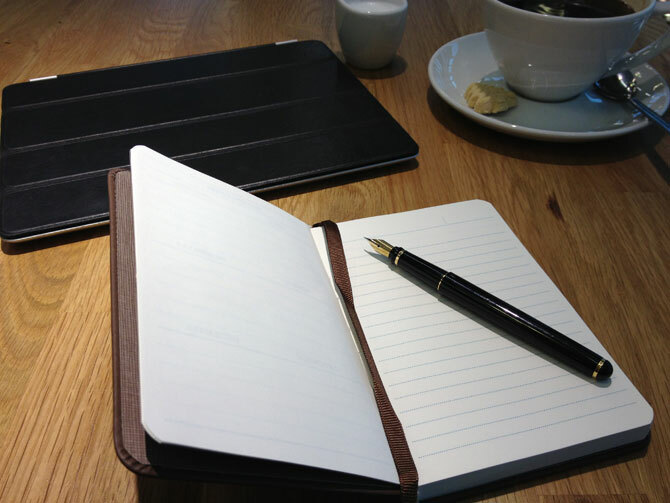 Now, as I sit here with my journal and my fountain pen in front of me, I haven't a clue what to write. So whilst I consider my options, I open a new document in Pages on my iPad and write this piece for my website. Self Employment - Taking the plunge.